The report emphasizes the overarching role the culture of contact and collision sports plays in the current recognition and management of concussions in young athletes, a culture that, in many settings, causes the seriousness of the threat to the health of an athlete, both acute and long term, from suffering a concussion to be downplayed or not acted upon. 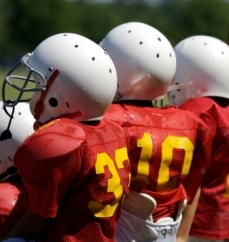 compliance with appropriate concussion management plans." "If the youth sports community can adopt the belief that concussions are serious injuries and institute behaviors and adopt attitudes that emphasize care for players with concussions until they are fully recovered, then the 'culture' in which young athletes perform and compete will become much safer," says the report. Consistent with a large body of evidence, the committee found little evidence that current sports helmet designs reduce the risk of concussions. It stressed that properly fitted helmets , face masks, and mouth guards should still be used, because they reduce the risk of other injuries -- such as skull fractures; bleeding inside the skull; and injuries to the eyes, face, and mouth. The marketing for some protective devices designed for youth athletes, such as mouth guards  and headbands for soccer, has advertised that these devices reduce concussion risk, but there is a lack of scientific evidence to support such claims, the committee said. The committee recommended an individualized treatment plan for concussion that includes physical and mental rest , but said current research does not indicate a standard or universal level and duration of rest needed. Athletes who return to play before their brain has fully healed may place themselves at increased risk for prolonged recovery or more serious consequences if they sustain a second brain injury, the report said. The assessment of an injured player is facilitated by the presence of a certified athletic trainer , team physician, or other health care provider at the venue (e.g., field, gymnasium, or rink) where the injury occurred, says the report. Unfortunately, the vast majority of young athletes practice and play in circumstances where trained personnel are not routinely available to make sideline injury assessments, and the responsibility for determining whether to remove an athlete from play falls on coaches, parents, players, and, perhaps, officials, who often lack the training necessary to perform such assessments. The committee endorsed the current preferred method of using multiple evaluation tools, such as symptom scales and checklists,  balance testing , and neurocognitive assessments , in making remove-from-play assessments on the sports sideline, and diagnosing concussions, which it said, may increase the sensitivity and specificity of concussion identification, although it noted that existing evidence is insufficient to determine the best combination of measures. Although the committee recognized neuropsychological testing  "as a powerful tool for understanding the cognitive effects of brain injury," it noted that it "has inherent limitations" and the existence of numerous factors that affect the resulting scores and interpretations. The report says that there is "general agreement that neuropsychological tests should not be used in isolation for diagnosis" and that symptom levels  are the "best predictor of diagnosis." Although the presence of symptoms can influence test results, the committee said, "potentially obscuring the accurate measurement of brain function, neuropsychological testing is one of several tools (along with symptom assessment, clinical evaluation, and the like) that may aid in concussion diagnosis." The committee noted that "the persistence of cognitive declines following symptom resolution in some individuals suggests there may be a role for neuropsychological testing in concussion management, for example, to help inform return-to-play decisions in these cases." It recognized, however, that "such a role for computerized neuropsychological testing has been criticized ... on the grounds that there currently is no evidence to show that delaying an individual's return to full physical activity on the basis of residual neurocognitive deficits actually improves recovery outcomes or reduces the risk of subsequent injury." While acknowleding that baseline neurocogntive testing had been called for and recommended for many years, the committee noted that very few studies had specifically examined the value of baseline testing, and that "establishing the validity of baseline testing is difficult ." The committee also noted that, while baseline testing was a common practice in schools and programs and has a theoretical foundation, it was expensive and time consuming and group testing had disadvantages. In fact, it pointed to the trend in recent years away from recommending baseline neurocognitive testing , at least for athletes not playing contact or collision sports with a high risk of concussion such as football, hockey, or lacrosse, citing as examples the fact that the consensus statement from the 4th International Conference on Concussion in Sport held in Zurich took the lack of evidence for baseline testing "as an indication that baseline testing should not be required," while the 2013 position statement of the American Medical Society for Sports Medicine stated that most concussions could be managed appropriately without neuropsychological testing, also noting the lack of evidence that use of baseline testing in the clinical management of concussions improves short- or long-term outcomes. "The universal 'screening' approach of using baseline tests may be a significant improvement, but there are very few data on that issue, and it is not clear how one could determine if one approach is 'better' than another (i.e., comparing post injury to one's own baseline or to normative standards[4,5])," the reports states. The report also challenges as lacking in scientific basis the almost universal recommendation by concussion experts that, once individuals are symptom-free, they follow a graded return-to-play protocol . "Aside from evidence supporting refraining from activities that risk additional injury or re-injury during the temporally undefined 'window of cerebral vulnerability' following a concussion," the committee noted that there was "little empirical evidence to support the timing of return to physical activity or to the use of graded approaches to do so." It said that "randomized controlled trials or other appropriately designed studies on the management of concussion youth are needed in order to develop empirically based clinical guidelines, including studies to determine the efficacy of physical and cognitive rest following concussion, the optimal period of rest, and the best protocol for returning individuals to full physical activity as well as to inform the development of evidence-based protocols and appropriate accommodations  for students returning to school." Surveys of retired professional athletes, the report said, provided some evidence that a history of multiple concussions increases risk for depression. Noting that very little research has evaluated the relationship between concussions and suicidal thoughts and behaviors, the report there was currently "no data to evaluate this relationship because existing post-concussion symptom evaluations do not assess suicidal thoughts." Consistent with the view of most concussion experts, the committee also concluded that whether repetitive head impacts and multiple concussions sustained in youth lead to long-term neurodegenerative disease, such as Chronic Traumatic Encephalopathy (CTE), remains unclear , thus pouring cold water on the prevailing media narrative , which has largely taken as a given the existence of such a causal link as a scientific fact. The report found that studies of the consequences of heading in soccer have obtained mixed results , with more recent studies showing no relationship between heading and neuropsychological impairment. It attributed the positive findings of some older studies to being due in part to the more frequent use in the 1980s and 1990s of soccer balls that absorbed more water, increasing the weight of the ball by up to 20 percent and potentially making them more dangerous for heading. Today, players use waterproof, synthetic soccer balls that absorb less water. While noting the movement towards limiting full contact practices  at various levels of football, the report found that support for such limits was "not universal. Some believe that the technology to quantify the number and magnitude of head impacts is not adequately developed and that the science behind setting a specific threshold is not well defined." Furthermore, the committee noted that :there is some concern that delaying or reducing contact in practice puts athletes at risk down the road as they have not adequately learned appropriate contact skills at an early age when the ability to acquire skills is at its greatest, pointing to recommendations by researchers, including Kevin Guskiewicz,  advocating for proper coaching techniques that emphasize fundamentals and the development and enforcement of sport-specific rules to prevent unsafe behavior and to reduce but not eliminate contact. While the report recognized that several organizations had called for a "hit count" in youth sports to limit the amount of head contact a particular player should experience over a given amount of time, and that "the concept of limiting the number of head impacts is fundamentally sound," the committee found that implementing a specific threshold for the number of impacts or the magnitude of impacts per week or per season was without scientific basis. accurately convey—the limitations of protective equipment as it relates to concussions." Until a universally accepted injury risk curve for concussions is established, as well as associated variants with age and perhaps direction, "claims of reduced concussion risk with protective devices will not be based on fundamentally sound science." The committee was encouraged by studies finding that greater athlete knowledge about concussions and more favorable attitude toward reporting possible concussion was associated with increased reporting prevalence of concussion and "bell-ringer" events in these youth." [11,12,13] At the same time, it recognized that "reporting intention may not always be an indicator of what an individual's actual concussion reporting behaviors will be," pointing to several recent studies[11,12,13] that "suggest that future concussion education initiatives should focus on improving attitudes and beliefs  about concussions among athletes, coaches, and parents." Although the committee that wrote the report examined useful scientific information to inform its study, it discovered that research about youth concussions was limited. To address these gaps in knowledge, the committee identified several areas for further research, including establishing a national surveillance system to accurately determine the number of sports-related concussions, identifying changes in the brain following concussions in youth, conducting studies to assess the consequences and effects of concussions over a life span, and evaluating the effectiveness of sports rules and playing practices in reducing concussions. "The findings of our report justify the concerns about sports concussions in young people," said Robert Graham, chair of the committee and director of the national program office for Aligning Forces for Quality at George Washington University, Washington, D.C. "However, there are numerous areas in which we need more and better data. Until we have that information, we urge parents, schools, athletic departments, and the public to examine carefully what we do know, as with any decision regarding risk, so they can make more informed decisions about young athletes playing sports." The report was sponsored by Centers for Disease Control and Prevention, U.S. Department of Defense, U.S. Department of Education, Health Resources and Services Administration, National Athletic Trainers' Association Research and Education Foundation, the National Institutes of Health, and the CDC Foundation with support from the National Football League. The Institute of Medicine and the National Research Council are part of the National Academy of Sciences, a private, nonprofit institution that provides independent, evidence-based advice under an 1863 congressional charter. The National Academy of Sciences, National Academy of Engineering, Institute of Medicine, and National Research Council make up the National Academies. 2. McCory P, et al. Consensus Statement on Concussion in Sport: the 4th International Conference on Concussion in Sport held in Zurich, November 2012. Br. J. Sports Med. 2013:47:250-258. 3. Harmon K, et al. American Medical Society for Sports Medicine position statement: concussion in sport. Br J Sports Med. 2013;47:15-26. 4. Echemendia R, Bruce J, Bailey C, Sanders J, Arnett P, Vargas G. The Utility of Post-Concussion Neuropsychological Data in Identifying Cognitive Change Following Sports-Related MTBI in the Absence of Baseline Data. Clin Neuropsy 2012;26(7):1077-1091. 5. Schmidt J, Register-Mihalik J, Mihalik J, Kerr Z, Guskiewicz K. Identifying Impairments after Concussion: Normative Data vesus Individualized Baselines. Med & Sci Sports & Exer. 2012;44(9):1621-1628. 6. Brooks BL, McKay CD, Mrazik M, Barlow KM, Meeuwisse WH, Emery CA. Subjective, but not Objective, Lingering Effects of Multiple Past Concussions in Adolescents. J Neurotrauma 2013;30:1469-1475. 7. Schatz P, Moser RS, Covassin T, Karpf R. Early Indicators of Enduring Symptoms in High School Athletes with Multiple Previous Concussions. Neurosurgery 2011;68:1562-1567. 8. Colvin AC, Mullen J, Lovell MR, West RV, Collins MW, Groh M. The Role of Concussion History and Gender in Recovery from Soccer-Related Concussion. Am. J. Sports Med. 2009; 37(9): 1699-1704. 9. Castile L, Collins CL, McIlvain NM, Comstock RD. The epidemiology of new versus recurrent sports concussions among high school athletes, 2005-2010. Br. J. Sports Med 2012; 46:603-610. 10. Eisenberg M, Andrea J, Meehan W, Mannix R. Time Interval Between Concussions and Symptom Duration. Pediatrics 2013;132(1):1-10. 12. Chrisman SP, Rivara FP, Schiff MA, Zhou C, Comstock R.D. Risk factors for concussive symptoms 1 week or longer in high school athletes. Brain Injury 2013;27(1):1-9. 13. Register-Mihalik JK, Linnan LA, Marshall SW, Valovich McLeod TC, Mueller FO, Guskiewicz KM. Using theory to understand high school aged athletes' intentions to report sport-related concussion: Implications for concussion education initiatives. Brain Injury 2013;27(7-8):878-886.